Writing Our Story: 2 WEEKS OLD! WOW...Today my little princess Josselyn Grace Alcala is 2 weeks old! I can not believe how fast these last 14 dayS have gone by. 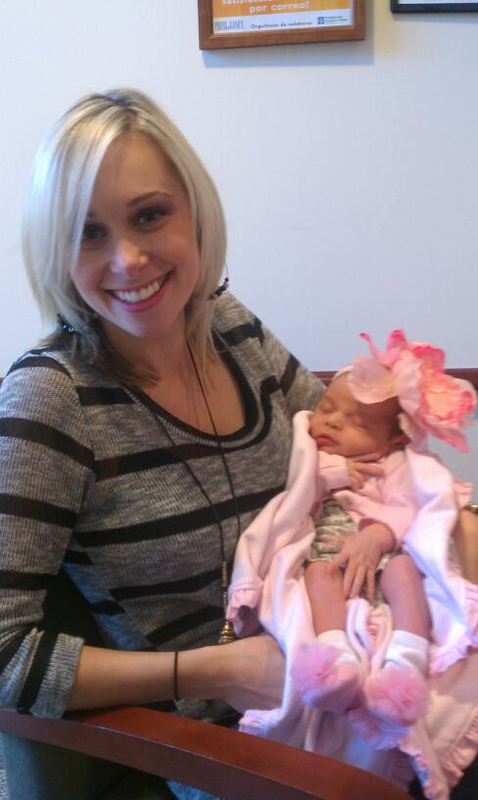 It is absolutely amazing how much my little princess has changed and grown in the past 2 weeks. Sometimes I wish I could just freeze time because the days seem to come and go way to fast! Josselyn at 2 weeks old! After Josselyn was born we spent 3 nights at the hospital. Unfortunately becasue they did have to use the vacuum to help me deliver Josselyn she developed jaundice. She was high risk for jaundice due to the breakdown of red blood cells in her head from the vacuum suction. Basically this causes a subsequent production of bilirubin. Anyways because of this Josselyn had to spend 2 days and 2 nights under this crazy light. It was horrible becasue we were not suppose to hold her unless I was feeding her. This made no sense to me becasue in every child birth prep class I took they emphasized how important skin to skin contact is in the first few weeks, yet all of a sudden I was supposed to leave my kid practically naked in this clear fish tank looking bowl with these awful goggles covering her eyes and this bright light shining in her face!!!! Ummm NO WAY especially since Josselyn screamed and cried every time we put her in the fish bowl. How is a baby who spent 10 months crammed up in a dark uterus supposed to feel comfortable all sprawled out under some bright light??? Luckily one amazingly nice nurse told me that If she were me she would just hold that baby and put the light over me and the baby. So we took her advice and for 2 days our family & friends all rotated holding Josselyn in our laps with the light above us (don't worry most of us wore sunglasses). Unfortunately most of the other nurses made us feel completely stupid for not just leaving Josselyn in the fish bowl. They made comments about how they couldn't believe she was being held all day and I better be careful not to spoil her (SHE WAS ONLY 2 DAYS OLD!!!). I ignored the comments and we continued to love on & comfort our little newborn even if it meant sitting under a light. We are sooo BLESSED that we have so many amazing friends and family who were excited to just sit there and hold Josselyn (even if it was under a UV light lol). Well Monday August 29th was a WONDERFUL day. 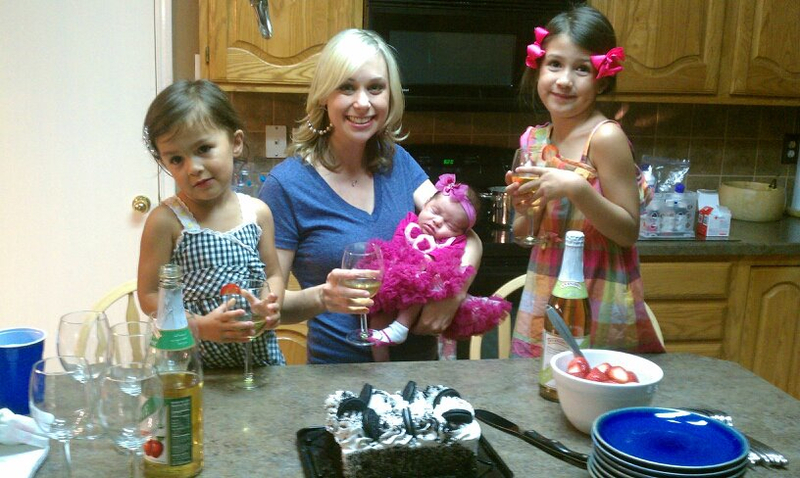 Not only was that John's 28th Birthday but it was the day Josselyn & I were released from the hospital. Josselyn's jaundice was much much better (it was now considered medium/low risk). We were told to just put Josselyn by a window during the day to get sun light & then I was told to feed her every 2 hours. Now let me just say that it is very difficult feeding a baby every 2 hours! By the time she finished one feeding it was time to feed her again! I did not want Josse to end up back in the hospital so I followed this schedule for 2 days until we went back to our follow up doctors appointment. At that appointment they weighed Josselyn and because she had plenty of fluids her jaundice was now almost gone & she was back up to her birth weight (that is really rare, babies have 2 weeks to go back up to their birth weight not 2 days lol). Josselyn basically gained almost 3 ounces a day while she was at home (most babies gain 1/2 ounce a day lol). Josselyn left the hospital at 7lbs 1oz and two days later was back up to 7lbs 7oz! It was then and there that I realized not only that my kid eats good but I have magical breast milk! After that doctor's appointment we could finally relaxed because our baby was finally, completely healthy! The next few days we spent resting at home. You would think that Josselyn was a celebrity by how many visitors she had come see her that week. John's parents came from Lubbock, my little brother flew in from Phoenix, she had Auntie Shelley, Auntie Traci & the girls come all the way from Midland and tons and tons of family & friends from the Dallas area drop by to see her :) It is pretty incredible how loved this little girl is already! It has been a bonus for both Josselyn and I that John was able to have 2 weeks off from work!!! So Daddy has been home with us this whole time. Now the majority of our time has been at home but we have managed to venture out a little. Besides going to doctor's appointments for both baby and Momma, Josselyn's first outing was on Labor Day at 10 days old. We went for a quick trip, guess where... the MALL! We were only there for about an hour but Josselyn was a little angel, she slept the entire time. The following night she went to Invictus for the first time. She slept through half of the service and then decided that it was time to eat. Her next outing was today and we went to Daddy's work in downtown Dallas. Josselyn slept the ENTIRE time. As you can see, Josselyn does wonderful at sleeping during the day. Nights unfortunately are a different story. Some nights Josselyn is wonderful and wakes up just two times to eat, other nights she prefers to hang out with mom and dad during the hours of 2am-6am. We are hoping that our little nocturnal princess will learn the difference between day and night. 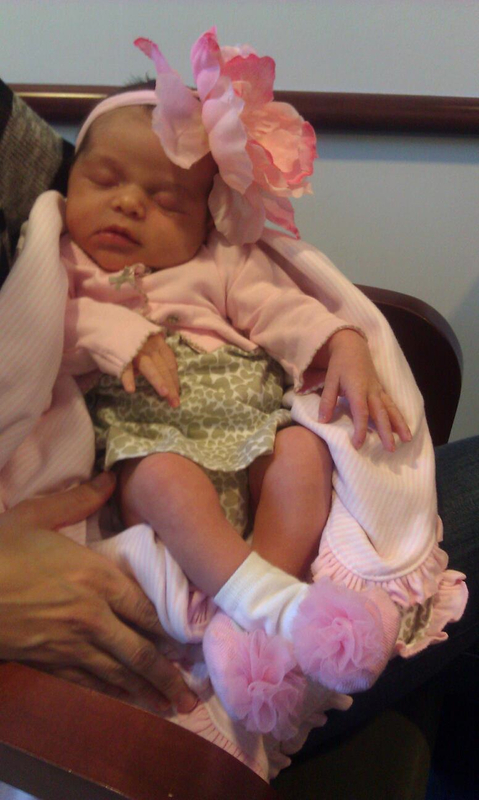 At 13 days old, we went to Josselyn's 2 week appointment. Our little girl is growing like a weed. She is now 22 inches tall (which is the 95 percentile for height) and she weighs 8lbs. 4oz. Once again the doctors couldn't believe how much weight Josselyn had gained (for some reason doctors & nurses get really excited when babies gain weight). Her goal was to be back at 7 lbs. 7 oz. which she totally surpassed. The nurses and doctors were quite impressed and they all joked about my "good" breast milk lol. I guess my child will never be malnourished ;) I am not sure how John and I ended up with a tall child...maybe this is just a little growth spurt or maybe she will be tall like her Auntie Amy. Either way she is healthy and doing great THANK YOU JESUS! I can not forget to mention Josselyn's FIRST BATH! It was at 13 days old and she absolutely hated it. Josselyn thought being wiped down with a wet wash cloth was bad enough but she really hated being in her baby bath partially submerged in water! Daddy did the dirty work and I just sat back and felt bad for poor Josse. Auntie Christina took pictures of this first time experience and Auntie Jen....well Auntie Jen basically hid in my closet so she would not be in any pictures lol. Anyways Josselyn ended up clean as a whistle but as mad as can be! Well today was a very full day! We had Josselyn's newborn pictures this morning. They started off great!!! 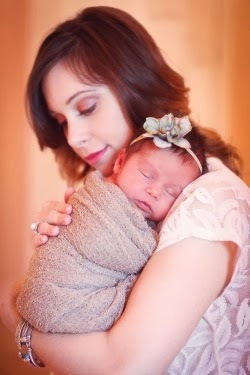 Our little princess slept so the photographer was able to capture some amazing shots. Then out of no where Josse decided that she was tired of being photographed naked so she PEED on our bed! Oh but that's not all then she decided to POOP while I am holding her!!! It was the most awful projectile poop that I had ever seen, it got everywhere! Things only got worse...Josselyn then decided that she was hungry so she started crying. I fed her just enough to hold her over (or so i thought) and when we came down stairs to wrap up the pictures & Josse started screaming bloody murder, so we could not take any more pictures :( DISASTER....I am hoping that there are some good pictures form the beginning of the session. Luckily things ended on a much happier note. Tonight we went to my brother & sister in laws (Joey & Stacey) house for dinner. 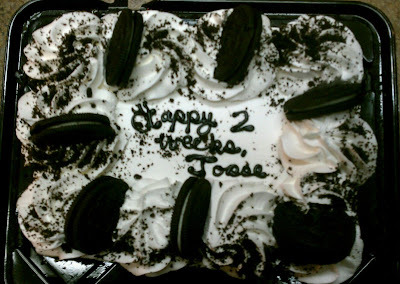 After dinner they brought out a "Happy 2 week" cake for Josse & they had apple cider for toasting. We had a wonderful time celebrating little Josse's 2 week birthday :) I am looking forward to all of her birthday's in the future! Well that is a little update over the past 2 weeks. Things have been a bit of a blur but I am trying to soak in every moment of every day. I still can not believe that we have this incredible baby girl. She is so perfect in every way and I love her more than I can even explain. She melts my heart every time I look at her & I can not even begin to imagine life without her. John & I both feel like we are dreaming because this all feels to good to be true. The Lord has truly blessed us with the most precious gift in the world & we are going to do everything we can to raise her to be an incredible world changer for the Kingdom of God! I will keep you all posted on our upcoming adventures!